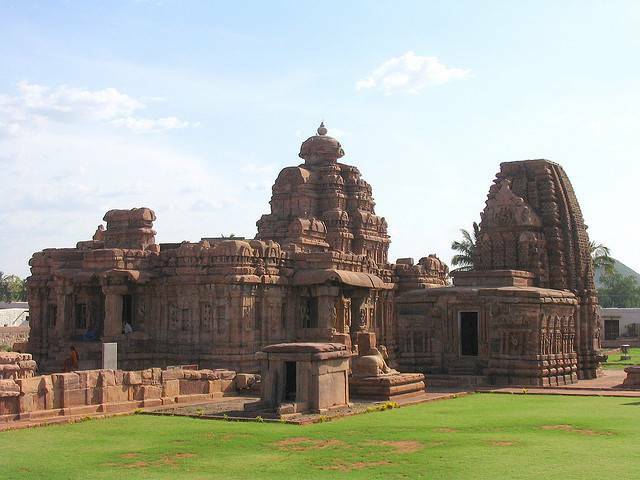 One of the prominent temples of Pattadakal, Virupaksha Temple was built by Queen Trilokyamahadevi, the consort of King Vikramaditya II, to celebrate his victory over Pallavas of Kanchi. The temple is well raised on platform and the main sanctum is of square shape. Since built to celebrate the victory over Pallavas, the temple resembles the Kailashanathar Temple of Kanchipuram. The outer wall enclosing the temple has tiny shrines for approximately 32 deities among which only few are remaining now. Floral and fauna motifs, elegant carvings of Ramayana, Mahabharata and Bhagavad Geeta are amazing craftsmanship you can see in Virupaksha Temple. In the straight line with main sanctum lies the Nandi Mandapam which has fine carvings on small raised walls.